If you planned on getting that non-existent music career of yours off the ground using music you uploaded to Myspace between the years of 2003 and 2015, I regret to inform you that you’re out of luck. Monday, Myspace announced they accidentally deleted decades worth of music due to what they’re calling a possible server migration error. A message on its website says that “any photos, videos and audio files” uploaded more than three years ago may no longer be available, meaning an estimated 50 million songs by 14 million artists are lost forever. Since it’s inception in 2003, Myspace was the primary vehicle for upcoming artists to spread their music and network across the globe, at one point hosting 53 million songs from 14.2 million artists. You can say it was Soundcloud before Soundcloud. Myspace attracted millions of users around the world and within years surpassed Google as the most visited website in the US. At one point in 2008, Myspace was even considered the leading social media site on the planet. But after it’s slow demise and inability to adapt to the ever-changing digital world the social media giant saw its end. The once go-to for online mingling is now a music-focused service that hardly anyone I know uses. Even still, it’s a shame they managed to lose what could potentially be hours of valuable data. Before BBC broke the news of Myspace’s folly Monday, there had already been rumors of such a thing circulating on Reddit last year. 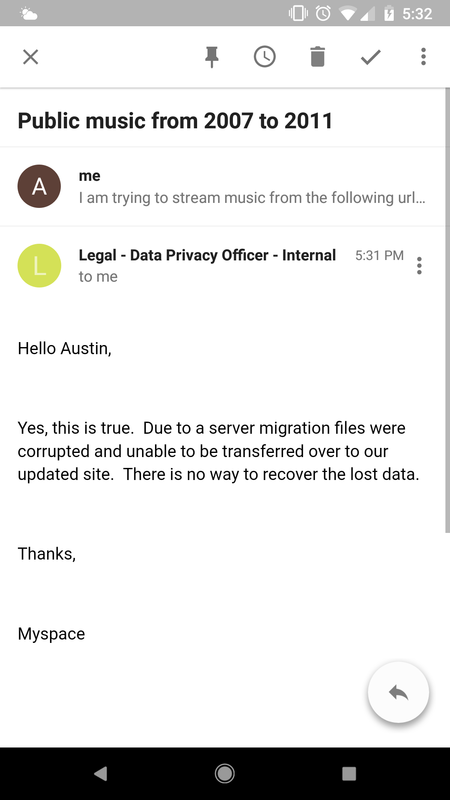 On February 2018, a Reddit user posted a transcript of a support email they received from a Myspace rep that stated, “There is an issue with all songs/videos uploaded over 3 years ago,” according to the letter. “We are aware of the issue and I have been informed the issue will be fixed, however, there is no exact time frame for when this will be completed. Until this is resolved the option to download is not available,” it continued to read. Months later more Reddit users uploaded their own emails which had similar responses. “Due to a server migration, files were corrupted and unable to be transferred over to our updated site. There is no way to recover the lost data,” a Myspace rep told a user in an email posted on Reddit seven months ago. While no longer a major player in the social media field, there are artists who were active on Myspace at its height that used it as an archive. Now, depending on if the artists stored the files elsewhere, there may be no chance at ever recovering those files again. The former chief technology officer at Myspace, Andy Baio, took exceptional interest in the news, tweeting that he suspects foul play. MySpace was bought by NewsCorp in 2005 for $580 million. It was sold in 2011 for $35 million to ad targeting firm Specific Media. At this time no artists have filed a suit against the company.